(From right to left) Mary Jane Alvero Al Mahdi, Chief Executive Officer of Prime Group; Salah Ameen, Managing Director of Prime Group; H.E. Amina Ahmed Mohammed, Chief Executive Officer of Emirates International Accreditation Centre; Abdullatif Abdulla Ali Al Gargawi, Chairman of Prime Group. In line with UAE’s consolidated efforts to become the world’s hub for halal trade, Prime Group, a leading UAE-based quality and compliance solutions provider in the region, has recently brought its expertise to Asia Pacific, making it the first and only halal certification body in the Philippines accredited by the Emirates International Accreditation Center (EIAC). 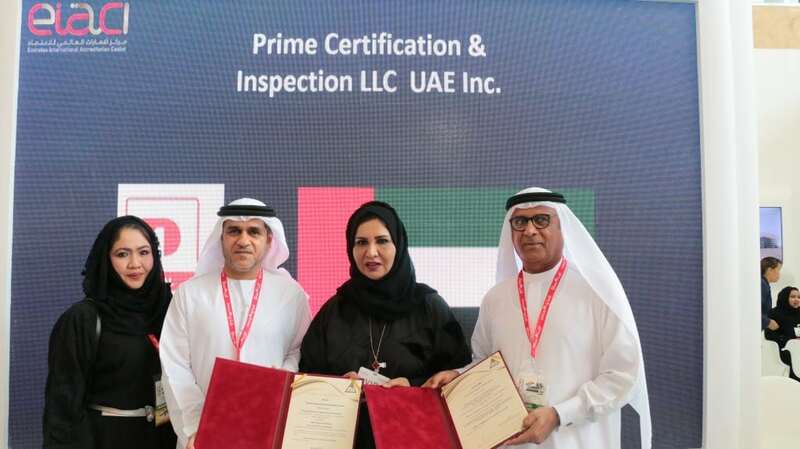 Coinciding with the world’s biggest annual food event, Gulfood 2018, EAIC awarded the certification to Prime Certification and Inspection Asia Pacific (Prime C&I Asia Pacific) at the Dubai Municipality booth. Prime Group has many firsts to its credit, as it was the first local halal certification body to be accredited by the EIAC, first certification body in private sector to achieve ISO/IEC 17065:2012 accreditation from EIAC and Prime C&I is the first certification body in the private sector to achieve three accreditations (ISO/IEC 17021-1:2015, ISO/IEC 17065:2012 & UAE.S 2055-2:2016) from the same government body. As the official body in Dubai responsible for the assessment and accreditation of organisations in the field of calibration, testing, inspection and certification of management systems, products and personnel, EIAC screens halal certification bodies under a rigorous process, which takes three months to even a year, before an accreditation is finally awarded. The accreditation bolsters Prime Group’s mission in providing Sharia-compliant products and services not only in the UAE, but also overseas. “With over 10 million Muslims in the Philippines, there’s certainly a strong demand for halal products and services in the country. We, at Prime Group, are committed to deliver quality certification services for all businesses to ensure compliance in international standards and practices. We want to create an environment of trust, so consumers are sure that what they’re consuming are truly halal,” Al Mahdi explained. The Philippines has since expressed its cooperation in international standards of halal certification, with the country enacting local policies, and recently joining a UAE-based global halal group to tap into a lucrative halal industry projected to amount to $3.8 trillion by 2022 . Prime Group, headquartered in Dubai, UAE, is a leading quality and compliance solutions provider in the Asia, Middle East and North Africa. Prime Group covers three business entities with various activities. The business entities are Geo Science Testing Laboratory (GTL), Prime Innova Training Center and Prime Certification & Inspection with branches worldwide. Prime Certification & Inspection branches located in UAE, Philippines and India. With more than 400 staff members spread across its subsidiaries nationwide, the company takes pride in its large pool of experienced, competent and highly qualified professionals in the field of testing, inspection, certification and training. Prime Group also provides integrated facilities management services, which include end-to-end solutions for a broad spectrum of needs, from the basic and essential to the more complex and sophisticated. Our facilities management services are designed to support companies in improving operational efficiency and creating a conducive work environment. People, processes, and technology are the three pillars of modern business. Prime Group specializes in their successful integration for the most desirable outcome. It is the most trusted 360-degree quality and compliance solutions provider in the region, having issued more than 1 million certificates and reports. DUBAI – The Emirates International Accreditation Centre (EIAC) is expanding this year to accommodate the rise in applications from UAE- and foreign-based certifying bodies, its executive director Amina Ahmed Mohammed told Salaam Gateway. Officially launched in January 2017, EIAC, formerly known as the Dubai Accreditation Centre (DAC), accredits certifiers for a range of activities, including halal. “For 2018 we have accredited five certifying bodies and still, we have more than 15 applications pending. We expect to accredit more than 20 certifying bodies by the end of this year,” said Mohammed.